I LOVE Asian food…Thai, Chinese, Japanese, Indian, but I don’t make as much Asian style food as I’d like. I’m pretty hopeless when it comes to stir-fries and curries…until my recent soba noodle and chickpea curry successes. 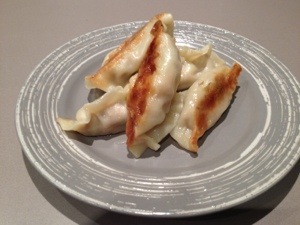 I’ve got laksa and Tom Kha Gai down pat and these little parcels of heaven – pork, ginger and spring onion pot stickers…yum! They’re easy to make and you could make them vego/vegan by leaving out the mince and adding extra vegetables. Either way you make them they are a perfect snack or accompaniment to a meal. You make a fair few in a batch, so freeze them in a container until you need them. To cook from frozen I find it better to steam them for about 8 minutes and then put them in the frypan to brown. You can skip the stock step because they’ll have already been steamed – easy! 1. Put mince, ginger, garlic, spring onions, carrot, wom bok, coriander, hoi sin, soy sauce and sweet chili sauce in a bowl and mix thoroughly until evenly combined. 2. Take a wrapper and place a small teaspoon of mince mix in the middle. Wet your finger/pastry brush and wet half of the edge. Fold in half and press edges together, starting in the middle and working your way to the edges, making sure you push out any air pockets before sealing. Press the dumpling on a flat surface to give it a flat bottom and crimp the edges to ensure it’s sealed. Repeat until you have used all the wrappers. 3. To cook: heat a large frying pan on the stove. Add olive oil and cook dumplings until lightly browned on the bottom. Add chicken stock to pan and quickly add a lid to trap the steam. 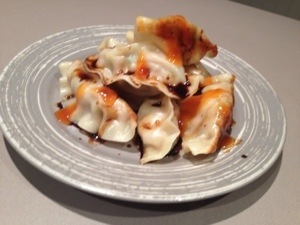 Cook the dumplings until the stock has evaporated. Make sure you move them around otherwise they’ll stick to the pan. Serve with soy sauce and sweet chili sauce.